I uninstalled WindowBlinds after two weeks of the trial period. I used Revo Uninstaller to do this, although it first ran the WB uninstaller before removing remaining traces of WB. After rebooting I discovered that elements of the WB skin were still in place! I then downloaded and ran (as Administrator) the Purge_WB.bat (available from https://cdn.stardock.us/support/uploads/Purge_WB.zip), and again after rebooting - the the WB skin (dark mode) still exists. It is especially noticeable for Office 365 Excel - the spreadsheet remains dark gray. How can I completely remove WB from the system? Windows 10, latest version as of Feb 5 2019, Lenovo Ideapad 720s. Have you reboot before? If yes, try these. 2) Apply any style that come with WB. 4) Apply default Theme/Style (This will actually disable WB). 6) See if all the colors back to normal Windows 10 Style. This did not work. 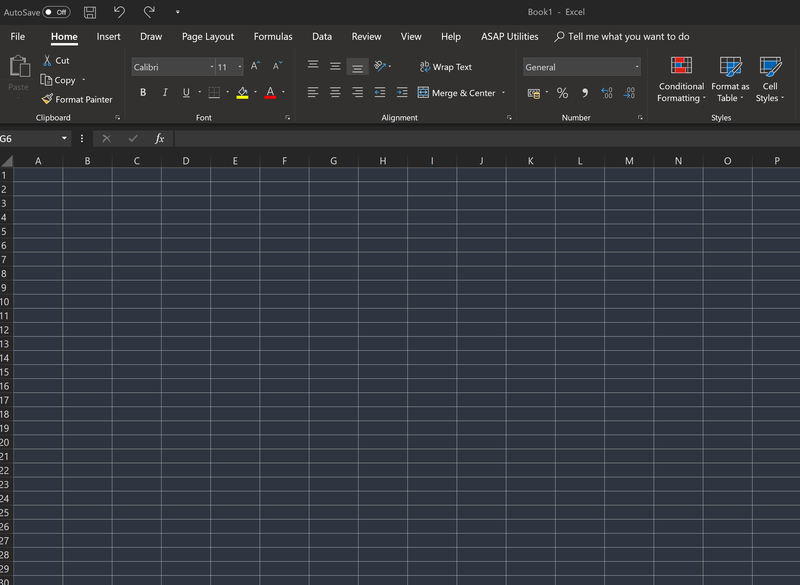 After reinstalling, setting the style to several different themes (and rebooting); then reverting back to Default Theme (and rebooting) the background colour of MS Excel spreadsheets remains grey (see image below). It's as if WB modified Office itself; or, changed the default theme itself. When I change the style the Excel background is modified to the new style colour. But after setting back to default, the default colour is grey (not white), based on the original WB installation. I had installed Flat Dark and Dark Mode from the online repository. I notice they are still within the reinstall set of styles. Where are they stored? How do I delete custom styles? Is there a way to edit the default theme in WB? One idea is that WB changed the default itself; perhaps it can be changed back using WB? Or, perhaps there is some registry editing may be required to fully resolve this, which is of course dangerous. Delete them. Open WindowBlind and right click the WB you want to get ride of and click "Delete". To totally delete the folder. Open Explorer. 4. Double click on "Users"
8.Then double click on Windowblinds folder. Just right click to delete any folder. Note. You can not modify the Default WB or delete.. Looking at your screenshot. Did you just change your excel Office Theme to Black? So if you need to bring the default white back just need to change back the Office Theme to White or Colorful. That is not the cause - the Office theme only applies to the ribbon and menus, not the excel sheet itself. Something during the original installation and operation changed the default theme itself, i.e. system colours, etc. Other than being able to download a *fresh* Windows 10 default style it seems I have no choice than to reinstall Windows. Is there such a style for download? Kinda brutal when trial software doesn't leave the system intact after removal. So I think I found a solution. I changed the Windows Theme to a new one obtained from the MS store. This apparently changed the system colours back to normal. It would seem then that WB changed the Windows Theme I had been using, and setting to default in WB did not restore the original theme state. By switching to a new theme it would seem system colours were reset. Perhaps obtaining a fresh one from the Windows also helped. I really not sure what is happening on your system but on mine it always revert back to default Windows 10 color every time I applied that Windows default style. Here a video I made just to show you how it look like on mine.